« How to configure multiple IIS websites to access using host headers? 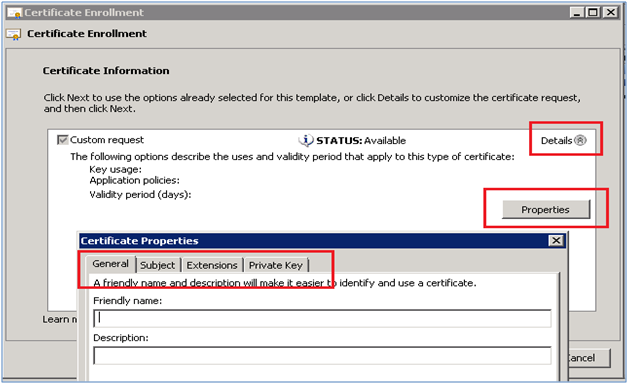 How to create a SAN certificate signing request for IIS web server? How to configure multiple websites to access using host headers? 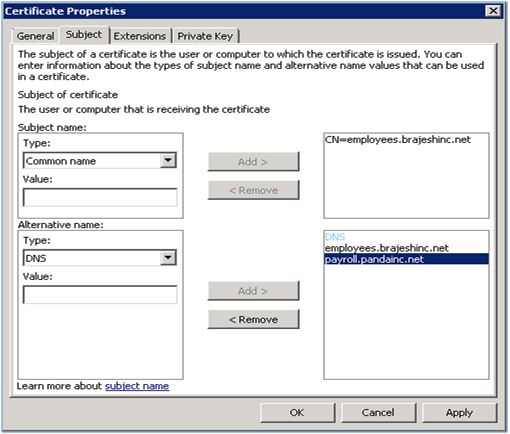 How to create a certificate signing request for our IIS web server? How to make sure internal certificate authority is supporting SAN certificate feature? 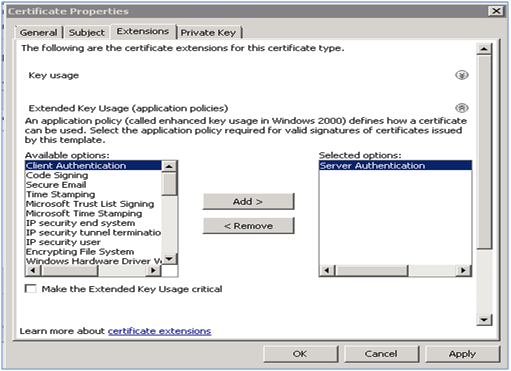 How to generate SAN certificate from internal Windows 2003 certificate authority? How to configure/import SAN certificate in IIS 7.x? 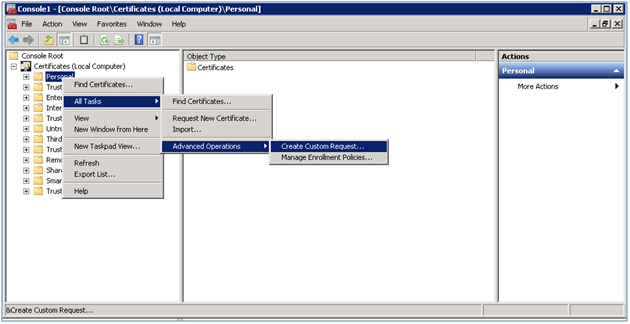 In Certificate Information Page click the Details icon then Properties. It will open up Certificate Properties window, where we can define different attributes. Under Private Key, select key size. Over here I just left it as default. You may like to select 4096 for production servers. Under Extension tab select Extended Key Usage; add Server Authentication from the available options. From Drop down Subnet Name section select Common Name & type the value. Preferably the primary domain name & then click Add. Under Alternative Name select DNS type all alternate DNS Names & add them. Under General Tab type a friendly name. Better to keep add a * in front of the friendly name now. It will help you to bind the certificate from IIS graphical user interface to all websites using same IP & port 443. If you don’t do this now, no worries, you can do it later or you can use Commadline tool to bind this cert. I have discussed the same in certificate installation/import post. It will generate “.req” file, you can open this file using notepad. You use this file to generate your SAN certificate from external public certificate authority or from your internal certificate authority server. This entry was posted on June 6, 2011 at 2:00 pm	and is filed under IIS. Tagged: SAN Certificate Request from Windows MMC. You can follow any responses to this entry through the RSS 2.0 feed. You can leave a response, or trackback from your own site. And how will i process the answer to this CSR ? Simply import the response into the very same certificate store folder were you have started the CSR generation. Thank you Tod for inspiring words. that i could assume you’re knowledgeable in this subject. Well along with your permission allow me to take hold of your RSS feed to keep updated with imminent post. Thank you a million and please continue the rewarding work. found that it’s really informative. I am gonna watch out for brussels. I will be grateful if you continue this in future. A lot of people will be benefited from your writing. Cheers! I was pretty pleased to discover this page. I need to to thank you for your time due to this fantastic read!! I definitely savored every little bit of it and I have you book marked to look at new stuff on your website. You can make use of flax meal, almond meal, soy powder, etc. learn composition and choose a stock photo website. The scientific background of photography shows that the use of it for exploring the natural world was exploited by big businesses. Thank you, this was incredibly helpful and exactly what I was looking for. Thanks good notes with appcmd. Good for my scripts. Dangit, we’d like an edit button. I followed this steps but I could not key in the Distinguished Name Properties. Or I can key in Distinguished Name Properties but I could not add multiple domain SAN. There is no options. How do I do both and generate the CSR? Not sure about the DN you are talking. 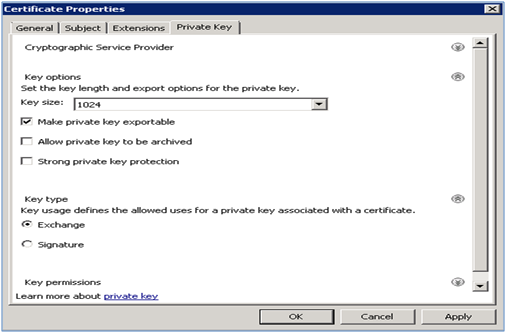 This is great except the Certificate Enrollment wizard resets the key length when you change the Key type to Exchange, so you need to first change the Key type to Exchange, then set the Key options for length and Make private key exportable which isn’t checked by default.